SAN PEDRO — The battleship USS Iowa is celebrating the big 7-0 on Feb. 17 with a grand birthday party. Guests are invited to join in the festivities that include a Franklin D. Roosevelt impersonator, live music and entertainment. Better to be early than late for this celebration, as the first 70 guests will receive a free challenge coin, courtesy of Iowa’s onboard store. Commanders traditionally present challenge coins in recognition of special achievement by a member of the unit. Tours, cake and plenty of activities for guests of all ages are also planned for the fun-filled day. In honor of the ship’s big day, the Pacific Battleship Center will offer free admission and a free Tour Alpha Ticket to those guests celebrating their birthdays on board the warship throughout 2013. Visitors must present proof of their birthday with a valid ID or copy of their birth certificate. The promotion will run through Feb. 21, 2014. The Tour Alpha Ticket includes tours of the ship’s big 16-inch guns, main deck, the FDR/Captains’ Cabin, the armored bridge, missile launchers, the video theater and more. Operated by the nonprofit Pacific Battleship Center, USS Iowa opened as a floating museum at the Port of Los Angeles on July 7, 2012. First commissioned Feb. 22, 1943 as the nation’s first ship of its class, Iowa and its interactive naval museum are dedicated to “Celebrating the American Spirit” through preservation and interpretation. The battleship Iowa birthday celebration will be held from 11 a.m.-4 p.m. Feb. 17 at 250 S. Harbor Blvd., San Pedro. 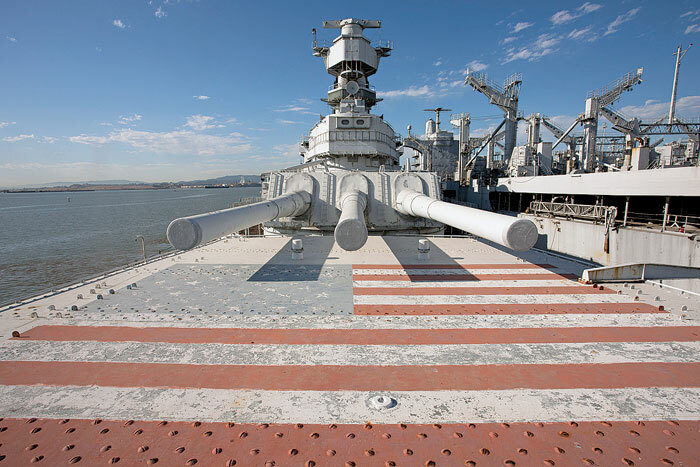 USS Iowa is open to the public from 10 a.m.-5 p.m. September through May; 9 a.m.-5 p.m. June through August. For more information visit, pacificbattleship.com. In Oct 1952 I served with the 1st Marine Division on what was later known as Operation Decoy. The Battleship Iowa was the flagship of the fleet during this engagement. Our staging area was off the coast of Wonson/Kojo North Korea. I was aboard an LST during this “landing”. We were part of a very large convoy of almost every ship imaginable. I won’t go into great detail about the operation but I did want to express my awe and admiration for the Iowa. It is a magnificent ship with awesome firepower. I am honored to have served in an operation of such magnitude with such a remarkable ship. At 88 yrs old I wish I could make it to the bit 7-0. Maybe someday I will.